Because Vermont Airbrush Face Painting is AWESOME! 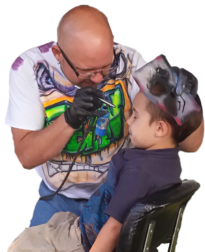 HyperDrive Airbrush Face Painting is our most popular service. We use only the best water & sweat resistant make up, ProAiir, made in the USA, which washes off easily with liquid soap & water. Many of our designs fit on the face and on the arm like a tattoo for those that prefer, so guests of all ages enjoy this amazingly entertaining art form. Airbrush Face Painting - the focus is on SPEED! Vermont's first choice for classic sponge and brush face painting. Our fun and entertaining painters will transform your guests into whatever they want to be. Our artists bring everything they need - tables, chairs, sparkles, makeup, mirrors and all the other tools of the trade. All you have to do is make sure to have a camera ready to capture great pictures of your transformed guests! We design our party set up to be portable which means we can fit in to just about anywhere. In the past we have provided entertainment in living rooms, park gazebos, basements, kitchens, back yards, garages, restaurants, and even on a real pirate ship!